Creativity has always been a huge part of my life. When I am unable to find the words to express myself, I turn to a palette of paint, my camera, music, choreography, a sketchbook, or a stoneware bowl and a wooden spoon. My creative aspirations have been there for me when I've been grieving or have felt lonely, and they've been what I use to communicate some of the happiest times in my life. Being creative grounds me. It gives me purpose. It makes me feel like I am contributing something good to a world that is often filled with pain. It allows me to grow. Over the last few years, I've made a lot of goals under the creative tab when planning how I intend to spend my time, but I haven't made any real attempt in following through. 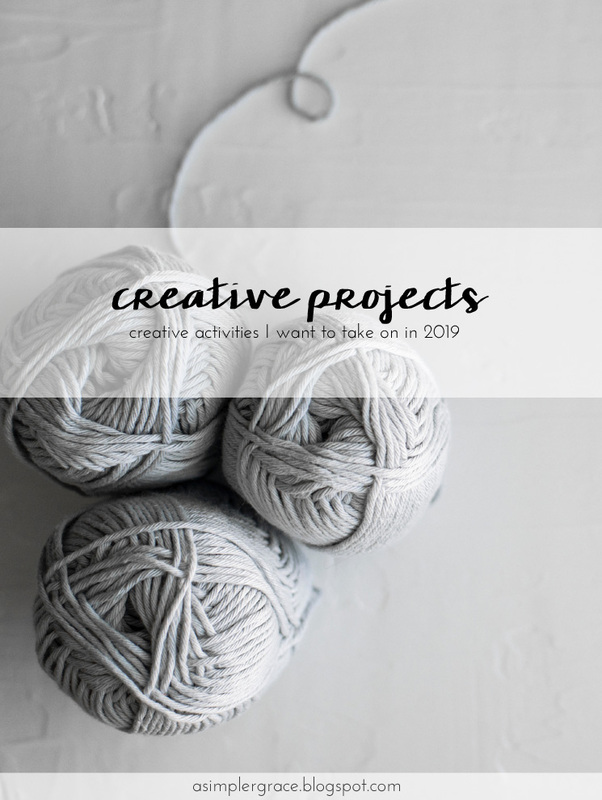 This year, because I'm focusing on finding peace in my life, I wanted to weave more opportunities to be creative into my schedule. By creating more, hopefully, I'll be consuming less and will be able to find a quiet stillness in my life. These are the creative projects I'll be working on in 2019. Of course, books would take a central role in my creativity this year. Not necessarily reading them - although I do consider the act of jumping into other worlds and living the lives of different characters to be creative - I want to spend my reading time doing more annotating and sketching of my favorite parts of the books, so that when I sit down to write my reviews, I'm able to articulate my thoughts more clearly. This is the list I'll be working from when choosing books to read in 2019. My grandmother taught me how to knit when I was in high school. When she passed away this fall, I was thinking about those days we had together - her encouraging me when I'd get frustrated after dropping a stitch or losing a whole project off my needles. I was really disappointed in myself when I remembered that I hadn't completed a single item that I'd begun working on since then. I find knitting to be calming and it's a great way to busy my hands while I'm listening to an audiobook or podcast. This year, I'd like to complete five (or more) knitted accessories from start to finish. My motivation is that I'd like to be able to donate hats, gloves, scarves, and blankets to my local shelter before the cold weather hits next year. Once upon a time, I owned a photography business with my ex-husband. After we disbanded and closed up shop, I pretty much packed my camera away and have only pulled it out when I had a reason to. This year, I want to pull my camera out and find a reason to use it. This will include more family photos, more snapshots from nature walks, more beautiful landscapes from my mountainous neighborhood. I am really looking forward to getting behind the lens again. If you've known me for any length of time, you'd know that I was born into the Partridge family. For generations, both sides of my family have been musicians or singers, a few of them professional. All of my brothers play an instrument, many of them sing, and when we get together, we often have jam sessions. I learned to read music in primary school when I took up the flute, but I am much better playing by ear. One instrument I've always wanted to learn was the ukulele. I think it would be really fun to get one and give it a go. Maybe I'll even write some original music and lyrics before the year is out. This was a project I had started several years back when I was doing the 101 in 1001 challenge, but this year, I am expanding it a bit. I plan to go through my digital files and clean them up and purge the junk. I want to create a better filing system (hello, external hard drive) for my photographs so I don't have to worry about my laptop crapping out and losing everything. In addition to my personal digital space, I want to do a major purge of who and what I'm following on social media, the apps I have downloaded to my devices, and my subscriptions. Consume less and I'll make room to create more. As I become more fluent in the Spanish language, I want to step outside of my comfort zone and begin a very big and scary project - translation. Learning a language for conversation is one thing, but being able to interpret and convey the message an author has written is a new animal. I've always been fascinated by how unique the different translations of the same book are. It really comes down to one's perception of the content and how well they understand the idioms of the language they are translating from. Obviously, this will just be for fun, as I don't expect to complete a completely accurate rendering. Perhaps I'll start with a children's or young adult book and see how it goes. My best friend wrote a book and I am so proud of him. I've been reading his notes and chapters as he's completed them over the last two years, but he gave me the first draft manuscript a few months back for the first pass of developmental editing. Right after that, life got busy for both of us and we forgot about it. He's coming up on some time where he'll be able to devote more energy to the project, so I want (NEED) to finish my notes for him. This is a priority. In 2018, I scheduled time to sit down every week and create something, whether it be painting or writing or making a piece of jewelry. That goal went largely unmet because I had a hard time creating on demand. This year, I want to embrace my creative energy and make time when I'm feeling inspired. If this means pushing other tasks aside for a few hours so I can pull out my paints, I'll do it. Here's to more organic creative inspiration rather than the forced kind. I have about 24 hours worth of tattoo work on my back. It had been a full piece-in-progress, but I became sick with a disease that prevented me from doing anything that would induce an adrenaline surge, so it was never finished and I'm okay with that. I love tattoos and have wanted more for years. I have a Pinterest board with lots of ideas and inspiration, but I'd like to custom design the next piece I get and that will be happening in 2019. I own stacks of cookbooks. Some of them, I've purchased. Some were gifts. Some were provided by publishers when I reviewed them. None of them have been pulled off the bookshelf in about three years. I know I need to purge this particular shelf, so I am going to cook my way through them and donate or trade the ones I no longer want. I started blogging in 2001. My first blog was all about food, where I shared sweet and savory recipes I'd created, a few of which have been re-posted here on ASG. 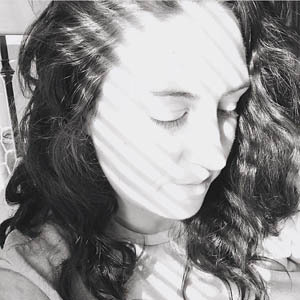 Then I started this blog, which was originally a mishmash of "life with my husband" posts and things that were popular in the blogosphere at the time - mostly tutorials or home tours, featuring a lot of oversaturated, grainy photos. It was only when I rebranded in the months following my separation, that I took my writing more seriously. From that point on, one of my goals was to write on other platforms and get my work out to a larger audience. This year, I'm making it happen. My book projects have taken a backseat for a few years. There are two of them, a nonfiction work about grief and sibling loss, and a magical realism novel. One, I've been too muddled in the research and details to want to complete. The other, a lack of focus and time. I've been following along with Helen Redfern's progress on her own novel and a few of the techniques she uses to plot out her writing has really resonated with me and I am inspired to put more time into these projects. There we have it. It looks like quite a list, doesn't it? It is indeed, but most of these projects will be completed in little bits of time over the course of the year. Many are activities I enjoy doing and they bring a sense of peace to my life, so that helps tremendously. How are you going to explore your creativity in 2019? The post Creative Projects | 2019 first appeared on A Simpler Grace. If you enjoyed this article, please feel free to share it with your friends! Don't forget to join the ASG Tribe! I love this. Makes me think of what more I need to do this year that is creative. Grad school stole time (aka creativity) that I need yo think of more. I didn't realize your disease couldn't coincide with adrenaline boosts. Do you have any allergies that would need an epi-pen? I love tattoos and design all of mine based on significant events in my life or people I encounter who make a difference. I love that you will be able to create lasting art on your body for 2019-does this mean you are feeling better? Well its wonderful to hear that you are leveling out a little. I can't remember how long we have 'known' eachother over the blogosphere but I know its been a struggle for you off an on and I am so happy to hear this. Our bodies are so interesting in all the complex ways they do and do not work. Ommmg this is amazing. Honestly, I just love these creative projects because they result in positiveness and simply gratefulness. I love it. Oh, and the digital clean up sounds so worth it but hard. I mean I can't seem to get that done. Let me know how that goes for you :D I would also love to see your photography. I am sure you are amazing at it. I purged a LOT of my cookbooks a few weekends ago. Honestly, I think I need to commit to only keeping two. I just don't need all of this. I can photocopy my favorite recipe and get rid of the book and someone else can love it. This weekend I did my scrapbook area and I got rid of a LOT but I feel like I could probably go down even more. Or I just need to commit to doing more. These are such great projects! I'm excited to see how they go for you! I'm working on video editing for my new youtube channel and working on my book. I'd also love to dive more in photography, picking up guitar/uke again, and then making a quilt for my mom. These are amazing, Lecy! Really excited for you. Love that you design your own tattoos - I hope you'll be able to get another one soon. Tattoos mean a lot to me, too! I love this list, Lecy. I can see them broken down into doable steps, days devoted to one or another. Progress made daily. Soul fed constantly. Can't wait to see how it turns out. These are great projects! I too want to to get back into photography (I'm hoping to sell stock photos + take travel photos) and write in my manuscripts. I hear learning the ukulele is easy, and I hope it's fun for you! I've always loved your photos, and I am excited that you'll be taking more of them this year! It sounds like you're going to have a very creative year. I hope to take more long walks this year as soon as the weather cooperates. I love this! I really like being creative too, though I don't really have the talent for a lot of it. However, I do plan on working on my own book this year. I also want to try and write for other sites this year - see if I can get paid for my writing here and there. We'll see! I am loving this list and wishing you lots of energy and joy to immerse it into your life. Creativity is such a strong thing for a happy life. How sad that it seems to get lost on the way to adulthood for so many of us. These are so many amazing creative goals! I wish I had more time to do things like this. For this year I am hoping to get a few craft projects done that have been on my list for awhile. I'm also trying to do more with photography and healthy cooking. Yes, I went through a period where I wanted to have all the cookbooks, but I never use them. What a waste of money and space. How fun! Can't wait to check out your new YouTube channel! That would be awesome to sell stock photos! Good luck! I haven't read The Lovely Bones yet. Definitely will though! Those are great creative goals, Lecy! I took translation classes in college and holy moly, it's difficult. We would spend whole session discussing the translations of a single paragraph sometimes, because fictional writing can be so 'interpretive'.